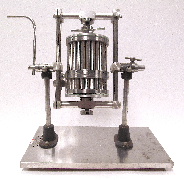 distribution apparatus recently donated to the Oesper Collections by Dr. Edward Bennett (Jensen-Thomas Apparatus Collection). Issue 32 describes the recent acquisition of an even earlier version of a Craig countercurrent distribution apparatus than the version that was described in issue 3 of 2010. Nathan Tallman, digital content strategist and assistant librarian for digital collections and repositories at the University of Cincinnati Libraries, has been selected as one of 13 future library leaders to participate in ILEAD USA – Ohio 2015. The restored 1913 Foster flashpoint apparatus. Issue 31 of Museum Notes recounts some of the puzzles that have confronted the museum curator when it comes to identifying the nature and use of some of the items that are donated to the museum. Have you visited the Neil Armstrong Website? The site pays tribute to Armstrong’s professional life from his early career as a test pilot to his monumental first steps on the moon and concluding with his time as a professor and researcher at the University of Cincinnati? Anyone curious about the career of the first man to walk on the moon should begin with this site. The rich content exposes users to highlights as well as little-known but important, interesting aspects of Neil Armstrong’s life. The University [of Cincinnati] has a nice online archive commemorating Armstrong’s time on the faculty. The collection includes some items from the astronaut’s early life, like his pilot’s log book from the Navy, but mostly it covers in pictures and documents his career in academia. The next reading in the Elliston Reading Series will be by poet Mary Szybist. Mary Szybist is most recently the author of Incarnadine, winner of the 2013 National Book Award for Poetry. She is the recipient of fellowships from the Guggenheim Foundation, the National Endowment for the Arts, the Rona Jaffe Foundation, the Witter Bynner Foundation in conjunction with the Library of Congress, and the Rockefeller Foundation’s Bellagio Center. Her work has appeared in such publications as Best American Poetry, The Kenyon Review, Poetry, Ploughshares, and two Pushcart Prize anthologies. Her first book, Granted, won the 2004 GLCA New Writers Award and was a finalist for the National Book Critics Circle Award. A native of Williamsport, Pennsylvania, she now lives in Portland, Oregon where she teaches at Lewis & Clark College. original location at UC Environmental Health and Safety. 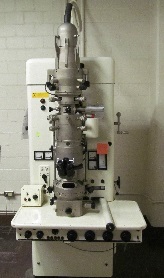 Issue 30 of Museum Notes highlights the recently acquired, circa 1964, Siemens Elmiskop 1A Microscope now on display on the upper mezzanine of the Chemistry-Biology Library in 503 Rieveschl. 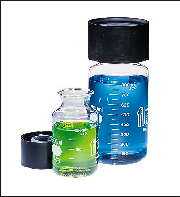 in the History of Chemistry are on public display at a given time. In order to make the remaining 75% available in some form, it was decided to initiate a series of short museum booklets, each dedicated to a particular instrument or laboratory technique of historical importance to the science of chemistry. Each booklet would include not only photographs of both displayed and stored museum artifacts related to the subject at hand, but also a short discussion of the history of the instrument or technique and of its impact on the development of chemistry as a whole. Several of these booklets are expansions of short articles which have previously appeared in either the bimonthly series Museum Notes, which is posted on the Oesper website, or the series Ask the Historian, which appeared in the Journal of Chemical Education between 2003 and 2012. You can access the booklets by clicking here. Typical modern-day fleakers with their patented caps. Scheduled maintenance has completed and the UC Digital Resource Commons (DRC) is available — drc.libraries.uc.edu. Please contact ucdp@uc.edu with any questions. Thank you.